Superhydrophobic product for building sector – TECNAN-NANOMAT "Think big, Act Nano"
TECNADIS AQUASHIELD ULTIMATE is a nanotechnology-based superhydrophobic product designed for vertical and tilted surfaces made of porous and low porous materials. It is a hydrophobic solution with very high performance and very low cost for the protection of construction materials such as stone, concrete, ceramic, Wood, etc… protecting them against the damaging action of water and humidity, and providing them with distinctive additional properties. 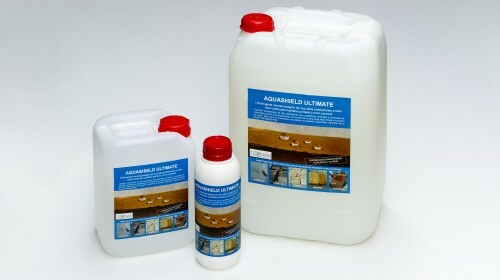 AQUASHIELD ULTIMATE is the only product base don nanoparticles, nanoparticles which permits to offer important potential advantages over its most prestigious competitors, such as Z-6689 (Dow Corning), Silres BS 290 (Wacker), Hydrorep (Fila) and Sikaguard 700S (Sika). – Superhydrophobicity, presenting a contact angle (> 150º) higher than any of its competitors, which results in higher water repellency. – Completely transparent, respecting the natural colour of the original substrate. – Good resistance and high durability when the surfaces are not exposed to a strong and continuous mechanical abrasion. – Total resistance to UV radiation.The structure of the compound has no weak points which can be attacked by UV radiation, and therefore, the resistance to external agents is much higher than its competitors. – Do not change at all the appearance, colour or structure of the treated substrate. – Total permeability to water vapor, allowing the natural processes of the substrate through its pores. – It can be perfectly reapplied, without removing the product remains of previous applications. – The active compounds do not react with the treated surface, maintaining the substrate unaltered.